"Hey big guy," I listened to the distinctive Scottish brogue over the telephone about 5 years ago, "I want to write a book. What do ye think?" Standing above 6' and well over 200 pounds, Ian James likes to call those smaller than him "Big Guy." I first met Ian James about 14 years ago at a craft show where he was demonstrating his fly tying skills and was practically giving away his salmon fly ear rings and hat brooches. Since that time, he and I have gone fishing together, kidded each other about our favorite Scottish football teams (Celtic and Ranger supporters can become friends! ), and provided that proverbial 'swift kick' while we both went through our own difficult times. In other words, Ian has been a long time friend and acquaintance. I have always admired his teaching abilities, having sat in on one of his fly tying classes in Guelph, Ontario; and watched as he has taken a beginning fly caster and made her into someone who could proficiently cast a fly to a bass that was laying in a pool on the Grand River, and share her excitement as she hooked and landed the fish. I have admired his uncanny abilities to locate fish and entice them to his fly when no one else was even getting hits. I have learned tremendously from him as he has shared his knowledge willingly about fish in general; everything from carp to trout to mooneye and the subtle differences between varieties of suckers. But write a book? A good book? I had my doubts. "Sure Ian," I replied, "That sounds like a wonderful idea. If you need some help, let me know." Several weeks later, I was able to take a peek at a few pages of manuscript, but after awhile I seriously began to question whether or not James would see his book in print. 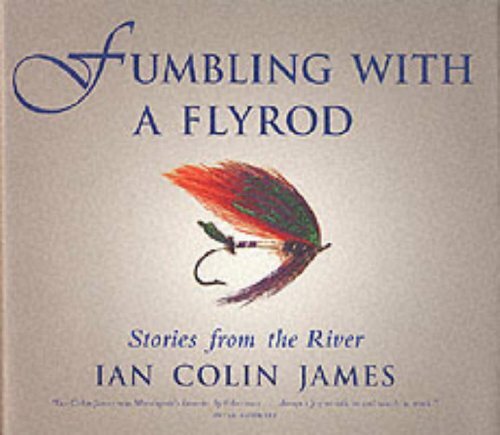 Was I ever surprised when I received a review copy of Fumbling With A Flyrod: Stories From The River from the folks at Harper Collins Publishers. And, right there on the front of it was the author's name, "Ian Colin James." Fumbling With A Flyrod is everything the subtitle says ('Stories From The River') and more. It has been a very long time that I have read a fly fishing book that kept me glued to the pages, wanting more, and feeling the excitement of catching fish while also causing me to laugh my head off. There are a number of great books of the fly fishing genre available, but so often, they seem to concentrate on the abstract enjoyment of fly fishing, the result sometimes being an almost metaphysical discourse on being human with a liking for fishing. Not so Fumbling With A Flyrod! You can tell that Ian's delight in fly fishing is pure and that his goal is to have as much fun as possible. While reading about his experiences of driving through Ontario snow storms to make the most of steelhead runs; breaking rods in car trunks; and describing attempts at boating huge musky on the fly, the reader is being completely entertained. How often have you read a fly fishing book and thought of the fish as a protagonist? Not that the author doesn't have a respect for fish; in fact James probably knows more about different fish species than most fly anglers, holding the mighty carp in as high regard as a trout. It's just that this book keeps you wanting to turn the page knowing that the author is going to keep your attention with his own unique sense of humor and brand of excitement. Another great feature of Fumbling With A Flyrod is that although it does not proclaim to be a fishing how-to or a fly pattern index, it does contain valuable information. As well, James has included a pattern index for every fly he mentions throughout the book. While reading about James' inner turmoil over being seduced by a beautiful blonde or going bass fishing, you will all of a sudden come upon a reference to a Mugwump fly. Immediately, the reader knows which of James' passions won the day, and you can turn to the back of the book and discover that this fly was invented in 1989, is used for steelhead, bass, pickerel, and even sheephead, and of course, the pattern is also included. I counted about 40 fly patterns. This alone makes the book pretty valuable to any fly tier! I really liked the fact James included the fly dressings in his book. I have never seen any other fly fishing story books that made it easy for the tier to re-create the flies that were mentioned. A great book that I found a delight to read! James will become known not only as a great fly angler, but a tremendous story teller as well.